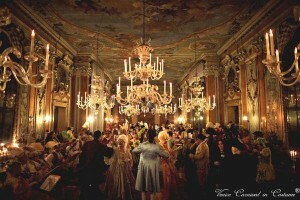 The Ballo Tiepolo®, a not to be missed international social gathering of the carnival of Venice since 1998, this year will see the Main Hall (Salone Centrale) of the noble floor transformed into a Venetian ballroom of the 18th century; here the Dance Masters, accompanied by a classical orchestra, will guide the guests through the period group dances, such as minuets, counter dances and the waltz. The Grand Ball will take place, as usual, at Palazzo Pisani Moretta, overlooking the Grand Canal, with frescos by great artists such as G.B. Tiepolo, and lit up by hundreds of candles. Opera singers, performers and dancers will entertain the guests during the rich welcome cocktail on the ground floor and in all the rooms of the noble floor where the dinner will be served. The menu of the evening, created by a Michelin star chef, consists of five courses (wines are included) and the guests, at the moment of reservation, will have the opportunity to choose between the regular and the vegetarian menus. After midnight a live pop band will play on the ground floor, where hot chocolate, sweets and Prosecco wine will be served, and people will be able to continue dancing. The palace, overlooking the Grand Canal, is a magnificent example of late gothic architecture (end of 15th century), and after several restorations and decorations throughout the years, is today one of the most beautiful palaces in Venice, with his frescos of G.B. Tiepolo and other painters. During the gala it is lightened by hundreds of candles adding a magical allure to the event.